Ruger Gunsite Scout Rifle Review - Is It The Perfect Bolt Action? 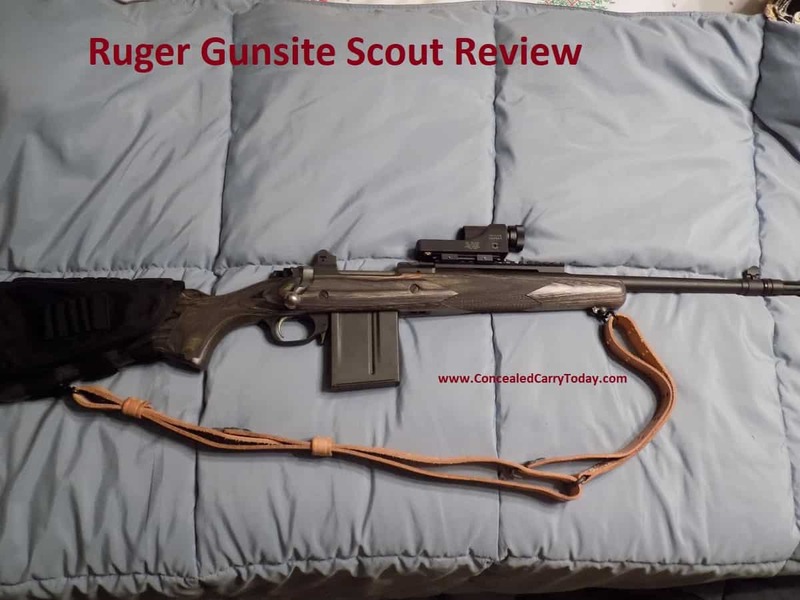 Blog Ruger Gunsite Scout Rifle Review - Is It The Perfect Bolt Action? Ruger Gunsite Scout Rifle Review – Is It The Perfect Bolt Action? Col. Jeff Cooper was a proponent of modern marksmanship and gun handling. Many people in the gun world are familiar with his shooting school and the techniques that he championed. Many today use his color code system to signify threat levels and he will always be known as an advocate of the M1911 in .45ACP. One of his pet projects was called the Scout Rifle. Without going deep into his reasoning, I will try to give a quick description of what he was trying to build. This was a bolt-action rifle with a forward mounted, long eye-relief scope of low magnification. Caliber was usually .308 Winchester and it was equipped with a detachable magazine. What he wanted was an all-around rifle, useful in a large variety of roles. There have been several attempts, most notably by Steyr, to build such a rifle for commercial sale. Ruger has embraced the Scout rifle and turned it into a commercial success. Their Gunsite Scout Rifle is available in several calibers and now even a left-handed version. They used their proven Mark II bolt action rifle receiver and made it into a rifle that Col. Cooper would be proud to shoot. It is a beautiful rifle to look at. The dark laminate with black accents goes nicely with the dark matte finish. Stainless steel is also offered. The stock has removable spacers to adjust the length of pull and a decent size recoil pad. It also features the Gunsite raven logo on the grip cap. Sling swivel studs are factory installed. The checkering on the forend goes completely under and up both sides. It matches the grip area, and is deep enough to be aggressive but not sharp or uncomfortable. The action is standard Ruger with scope bases integrated into the receiver. It has a three-position safety so that it can be loaded and unloaded with the safety on. A lever on the left side of the action easily allows the bolt to be removed. A set of rings comes with the rifle as standard. This rifle, however, has a M1913 Picatinny rail mounted forward of the action on top of the chamber area of the barrel. Either set up can be used without removing the other. This makes your scope system very versatile and accommodates just about any scope. The rear peep iron sight is removable should you decide to use the rear scope base. The front sight has wings to protect it. The barrel is offered in both 16 or 18-inch lengths. Short enough to be “handy,” but is still able to maximize the performance of the cartridge. A rather substantial flash hider is attached to the end of the barrel. I have not fired this gun without it but I would believe that it helps greatly with surplus ball ammunition originally meant for battle rifles. Added to the front sight, the muzzle end of the Scout reminds me of the Mini-14 GB. Oddly enough, the trigger guard is plastic. It seems very tough but surprised me considering that the rest of the rifle is metal and wood. The trigger itself is smooth and the pull relatively light. Built into the front of the trigger guard is the magazine release; a simple lever that is pushed forward to drop the magazine. The magazine does not have a front hook, lip, or hole like many rifle magazines. This allows a little more wiggle than I like, but it never affected function. One of the earliest articles that I read about this rifle explained the reason that the magazine is a proprietary one. M14 magazines were preferred and tried but problems in feeding with the Ruger bolt forced them to use their own design. I personally think that is very unfortunate because I love to have multiple weapons use the same magazines. The ten round box magazine is sturdy and feeds reliably. The factory metal magazine can be replaced by polymer versions as well. They are offered in 3, 5, (for hunting) and 10 round versions. So far, I have not found anyone but the factory that offers magazines. At about $35-40 apiece, I wish I could find less expensive alternatives. I cannot recall seeing any of them in a retail store or even at a gun show. I have been looking for a while now and just did not want to order them online. This rifle provides a great base to build on. A stout leather sling will allow for more supported shooting positions and provide a hands-free carry option. Since the scope mount is just a little taller than some, I found a cheek rest pad helped give just a little height to the stock. This one is by Blackhawk, but a nice leather one would work well also. The extra storage allows for specialty or just more ammunition to be carried along with the ten rounds in the magazine. I personally like long eye relief scopes, but don’t do a lot of long distance shooting anymore. I just feel the forward mount allows for a wider field of view rather than restricting your view and giving you tunnel vision. That said; either way is possible with this rifle. I see an undecided person purchasing it as a brush gun with iron sights and later adding a scope as their eyes age. This one is equipped with a Trijicon Reflex that does not magnify but allows quick target acquisition and puts everything on the same sight plane. Other friends of mine who purchased this rifle used a pistol scope with a see-through mount. I also would recommend it to move around among members of a family. It is a little heavy, but solid and a good rifle for an intermediate shooter. I can see it working well as a deer rifle in .308 or varmint gun in the .223 version. If you need an all-around rifle or bolt-action companion to a semi-automatic, this one is well worth your consideration.